CARICOM works in 20 countries – fifteen Member States and Five Associate Members – to provide products and services to positively impact the lives of its more than 16 million people. Our vision of “a Caribbean Community that is integrated , inclusive and resilient; driven by knowledge, excellence, innovation and productivity; a Community where every citizen is secure and has the opportunity to realise his or her potential with guaranteed human rights and social justice; and contributes to, and shares in, its economic and cultural prosperity; a Community which is a unified and competitive force in the global arena”, rests on the four pillars of economic integration; functional cooperation; foreign policy coordination; and security. Guided by our Core Values, we work to achieve this vision and our objectives through our governments and a decision making structure of: Organs, Bodies and Institutions. Our work is further facilitated and expanded through partnerships with Civil Society, international development partners (IDPs) and international financial institutions (IFIs) and Third States. The Principal Organs of the Caribbean Community (CARICOM) are: The Conference of Heads of Government (commonly called “The Conference”) and The Community Council of Ministers, (commonly called “The Council”). The Conference of Heads of Government which consists of the Heads of Government of the Member States is the supreme Organ of the Caribbean Community and determines and provides its policy direction. In addition to this function, it is the final authority for the conclusion of Treaties on behalf of the Community and for entering into relationships between the Community and International Organisations and States. The Conference is also responsible for making the financial arrangements to meet the expenses of the Community, but has delegated this function to the Community Council. Decisions of the Conference are generally taken unanimously. The Bureau, established by the Conference of Heads of Government, is an aspect of the supreme decision-making organ of the Community (the Conference). It comprises the chairperson of the Conference, the outgoing and incoming chairpersons of the Conference and the Secretary-General, acting in the capacity of chief executive officer. · Providing guidance to the Secretariat on policy issues. The Community Council of Ministers, one of two Principal Organs of the Community, is responsible for the development of strategic planning and coordination in the areas of economic integration, functional cooperation and external relations in accordance with the policy directions established by the Conference. 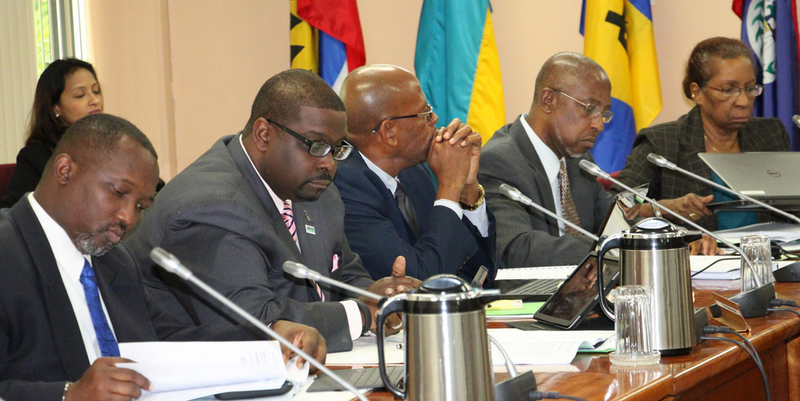 The Community Council, among its other four functions, also serves as a preparatory body for the Meetings of the Conference and approves the budget of the CARICOM Secretariat. subject to paragraph 5 of Article 20 of the Revised Treaty of Chaguaramas, amend proposals developed by the Ministerial Councils or request them to develop proposals for the achievement of Community objectives, and have responsibility for promoting and monitoring the implementation of Community decisions in the Member States. undertake any additional functions remitted to it by the Conference, arising under the Revised Treaty of Chaguaramas. Government, is assisted by four `organs’, three `bodies’, and by the CARICOM Secretariat - `the Principal Administrative Organ”. The Council for Trade and Economic Development (COTED) promotes trade and economic development of the Caribbean Community (CARICOM) and oversees the operations of the Single Market and Economy. undertake any additional functions remitted to it by the Conference, arising under this Treaty. Each Member State shall be entitled to designate alternates to represent it on the COTED. The Council for Human and Social Development (COHSOD) promotes human and social development. Each Member State shall be entitled to designate alternates to represent it on the COHSOD. The Council for Foreign and Community Relations (COFCOR) determines relations between the Community and international organizations and third states and promotes the development of friendly and mutually beneficial relations among member states. Each Member State shall be entitiled to designate an alternate to represent it on COFCOR. Only Member State possessing the necessary competence with respect to the matters under consideration from time to time may take part in the deliberations of COFCOR. Legal Affairs Committee (LAC) (comprising Attorneys- General and Ministers of Legal Affairs) advises the Organs and Bodies. This Committee replaced the Standing Committee responsible for legal affairs. Budget Committee examines the draft work programme and budget of the Secretariat and makes recommendations to the Community Council. The CARICOM Secretariat (CCS) is the Principal Administrative Organ of the Caribbean Community and has a mandate to provide a wide range of services to promote regional integration in the Community. These services include research and development; co-ordination of the activities of donor agencies, international regional and national institutes; project development and management; dissemination of information; foreign and community relations; technical cooperation and servicing of meetings of the various Organs of the Community. The Mission Statement of the Secretariat is: To contribute, in support of Member States, to the improvement of the quality of life of the People of the Community and the development of an innovative and productive society in partnership with institutions and groups working towards attaining a people-centred, sustainable and internationally competitive Community. Together these positions comprise the Executive Management of the Organisation and are responsible for the strategic management and direction of the Organisation and for working closely with the Councils and their Chairpersons to promote the implementation of decisions. A quasi-cabinet of individual Heads of Government has been constituted to spearhead action in sectors critical to the Region's integration and as a vision of development into the Twenty-First Century. Established in 1975, CARDI’s aim is to contribute to agricultural development by conducting research and by exposing farmers and other persons involved in agriculture to appropriate technologies. The Caribbean Agricultural Health and Food Safety Agency (CAHFSA) contributes to enhanced agricultural health and food safety in the Caribbean Community. To optimise the Caribbean Region’s export potential through facilitating innovation and the creation of world class brands capable of successfully competing globally. ITU (International Telecommunication Union) is the United Nations specialized agency for information and communication technologies – ICTs. To ensure the stability and well-being of Member States through mutual cooperation, in order to maximise regional security in preserving the social and economic development of our people. The Caribbean AgriBusiness Association (CABA) represents the Caribbean Region’s first agricultural association. It was officially established in May 1998. UWI was established in 1962 with Her Royal Highness, Princess Alice, Countess of Athlone as the first Chancellor and Sir Arthur Lewis the first Vice Chancellor.